Who doesn’t love cheesy bread? I tend to deprive myself, since it’s not exactly, well, healthy. Make no mistake, I’m not over here reinventing the [cheese] wheel (I apologize for that pun); this is not a low-cal or fat-free dish by any stretch of the imagination. But for those watching their gluten intake, this is definitely a viable replacement for the original. There’s something else: the base for this cheesy bread actually plays double-duty as a PIZZA CRUST. Yep, it’s perfect as the cornerstone of a saucy, cheesy culinary delight – it’s firm enough to handle cheese, sauce and toppings, but still soft and delicious. The cherry on the top is that it’s super easy to make. Prepare pan: I used a cookie sheet and lined it with parchment paper, and then lightly sprayed the paper with high-heat cooking spray. Beat the eggs with the water until combined. Add your seasonings and mix well. Sift coconut flour (or just crush the lumps with your fingers) and whisk into the egg mixture. 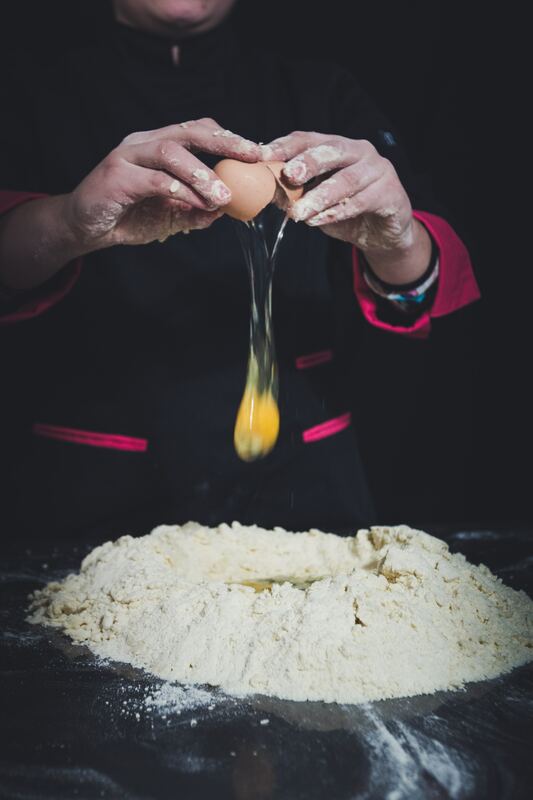 Once everything is mixed, you may need to let the dough sit for a couple of minutes to allow the flour to soak up excess liquid. If it’s too thick, on the other hand, you can add water a tablespoon at a time until you’re happy with the consistency. 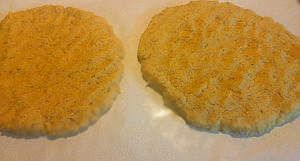 Spread the dough onto the prepared pan, making two 8-inch rounds. 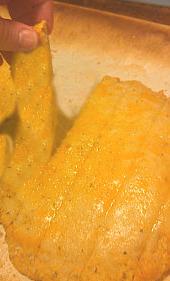 Bake for 11-15 minutes, until the edges are slightly browned and the center is set. Then, using a pastry brush, lightly brush the tops with butter. Sprinkle ¼ cup of cheese evenly on each round. Stick it back into the oven and set the oven to BROIL. 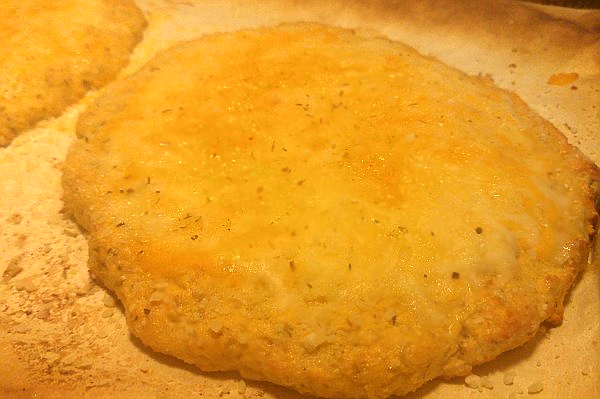 As soon as your cheese melts and gets bubbly, pull the pan out of the oven. Let rest until the cheese sets a bit, and then slice into strips with pizza wheel.